Former Weather Underground terrorist and long-time Barack Obama associate William Ayers has posted a cartoon at his blog, trying to explain away his statement that he feels he “didn’t do enough” during his tenure as a violent radical. The Weathermen tried to kill my family. 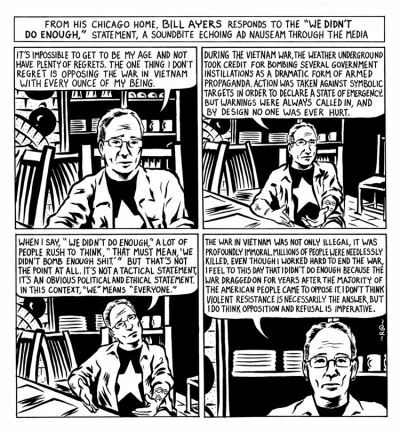 Zombie points out another fact that’s rather inconvenient for Ayers’ claim that his bombings were intended to “resist” the war in Vietnam: the majority of their attacks occurred after the US had already pulled out of Vietnam.